Khalid’s current role is the Founder and CEO of Glowork a women empowerment organization that has created thousands of jobs for women. This led Glowork to be awarded the Best innovation globally for job creation by the UN, ILO & World Bank. He is a proud Ashoka Fellow, & a Global Shaper at the World Economic Forum. In March 2014, Khalid was elected to become a Young Global Leader at the World Economic Forum for his work in social entrepreneurship. Previously he held the role of COO- Markets at KPMG in Saudi, Kuwait and Jordan which helped him secure an expertise insight into all the key aspects of strategic and successful marketing and operations. Khalid managed to lead the firms he worked with to over 30 key awards which were aligned to the firm’s overall corporate goals and strategy in 2013 Khalid led Glowork to an investment of over 16M USD to expand its current operations into different verticals. Khalid is an active writer & has contributed to international publications, such as the Huffington Post, as well as publishing a book entitled “Communicating effectively in the work place”. All this led him to being awarded the Excellence in Entrepreneurship award at the Global Thinkers Forum, The Best Head of Marketing in the Middle East, Saint Mary’s University Young Alumni of the year, selected as one of Endeavor KSA high-impactEntrepreneurs and as a Amends Fellow at Stanford university, Ranked #3 in the 30 under 30 Gulf Business Magazine powerlist & ranked in the top 500 most powerful Arabs by Arabian Business Magazine. 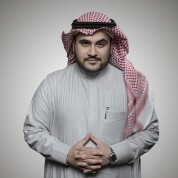 Khalid also sits on a number of Advisory boards throughout the Globe such as the CMO Council Advisory Board, the Country Officer for Women Campaign International, Steering committee member at the Ministry of Labor in Saudi Arabia, Steering committee member for talent mobility at the World Economic Forum, Advisory Member at Saudi Broadcasting, a judge at the Hult Prize, Employment Committee Member at the Riyadh Chamber of Commerce, Board Member at DAF Consulting Firm, & a mentor at the Founders Institute at Silicon Valley.